Picture you and your loved one escaping to beautiful Lake Superior – the world's largest freshwater lake. You can enjoy the sparkling waters, gorgeous sunsets, and fantastic attractions in Duluth, a vibrant city on Minnesota's North Shore. Duluth is home to the famous Aerial Lift Bridge and Canal Park, where you'll find countless restaurants, boutique shops, and art galleries. To help you plan the perfect romantic getaway, we've compiled a comprehensive list of the top Duluth destinations that are conducive to rekindling the flame that brought you together. On our list of Top Duluth Romantic Getaways you'll find luxury resorts, distinct bed and breakfast inns, and inspired lakefront hotels. Discover a place that's right for you then pack your bags! Romance awaits you on the shores of Lake Superior. Imagine spending time alone together in a beautiful suite with panoramic views, where you can peacefully watch the sea vessels enter the harbor. This is the reality at South Pier Inn, Duluth’s premier ship watching hotel. You will find South Pier Inn at the foot of the world-famous Aerial Lift Bridge. The views from this hotel don’t get much better. From your private balcony, you’ll be able to look eye-to-eye with ships’ captains as they pass by. For the ultimate views, choose to stay in one of South Pier Inn’s Grand Panoramic Corner Suites. When you’re not gazing out over majestic Lake Superior, enjoy your suite’s luxurious amenities. Relax in the two-person whirlpool tub or in front of the cozy gas fireplace. Some suites feature a convenience center with a microwave and sink. Every beautifully appointed suite comes with a refrigerator, coffee maker, and many more amenities that will ensure you have a comfortable stay. There are many things to see and do within walking distance of the inn, like the 4.2-mile Lakewalk that meanders along Lake Superior’s shoreline through sculpture gardens, city parks, and the Duluth Rose Garden. Other attractions include Canal Park, where you’ll find several antique stores and many great restaurants, and numerous art galleries. Rekindle your romance along the shores of Lake Superior at South Pier Inn! Take a romantic stroll at sunset along the miles of sandy beach just across the street from South Pier Inn. Start every morning off right with South Pier Inn’s complimentary continental breakfast before you set off to explore the area. Sometimes you just need to getaway and spend quality time with your sweetheart. And what better place than on the scenic shores of Duluth, overlooking the stunning Lake Superior. Whether you're planning a weekend trip, celebrating an anniversary or holiday, Fitger's Inn is the perfect place to escape the stress of everyday and focus on what's important: each other. Located in the heart of Duluth just steps away from beautiful Lake Superior, Fitger's Inn is Duluth's historic lakefront hotel. The inn was originally home to Fitger's Brewery and has since been renovated into a charming destination for couples to unwind together. You'll love the historic atmosphere that is still present in every nook and cranny. Choose from a range of luxurious accommodations including standard, deluxe, luxury, executive, and double whirlpool suites. Featuring a range of amenities such as cable television with HBO, Aveda products, and in-room coffee you'll be sure to feel comfortable and relaxed in whatever accommodation you choose. The double whirlpool suites are especially ideal for a romantic vacation. Start every morning with a complimentary continental breakfast before heading out and exploring the area. With direct access to Lake Superior and Canal Park, there's plenty of outdoor activities you can enjoy throughout your stay. Stroll along the shore, enjoy lunch on the beach, or spend a day window-shopping in the city. A variety of unique shops are just minutes away from the inn! Spend the night indoors and order room service through Midi Restaurant & Wine Bar! It's the perfect way to unwind with your sweetheart and enjoy an intimate evening together in the privacy of your room! Fitger's Inn offers discounted salon and spa services through Shear Katz! Not mention the wide selection of brews available in the first floor brewery shop! If you’re looking for a destination that is unique, charming, and romantic– you’ll find it at The Inn on Gitche Gumee. This inn has nine suites and one private cottage, meaning you’ll find the peace and quiet you desire. Each suite is uniquely decorated and features hand-hewn wood artistry, created by the inn’s owner, Butch. In your suite you’ll also discover fresh flowers and hand-pieced quilts. These charming details, along with amenities like a TV, DVD player, microwave, and refrigerator, will make you feel at home. For a truly romantic getaway, make sure you stay in one of the suites with a two-person whirlpool or stone fireplace. You’ll be able to enjoy wonderful views of the three-seasons gardens from your private balcony or deck. If you’re looking for an even greater level of privacy, stay in the 3 Bears’ Cottage, which features a full kitchen, breakfast nook, whirlpool tub, and a grand four-poster bed. Best of all, you can take in spectacular views of Lake Superior from your deck and large living area. Discover this romantic retreat just minutes from downtown Duluth! Gitche Gumee Gifts features northern and country handcrafts. "Gitche Gumee" is the Native American name for Lake Superior. Look no further than the Park Point Marina Inn if you want the ultimate on the water and romantic Duluth experience. Located only 50 feet from the shores of the mighty Lake Superior, Park Point Marina Inn is one of the newest premier resorts in Duluth. Being located in the marina gives the inn a relaxing and romantic feel while only being a short trip from the vibrant downtown area. Built recently in 2014 the inn was designed to pay tribute to the historic Duluth Boat Club that stood on the same location almost 100 years ago. The tribute to the past only exists in decor and general spirit because the amenities and accommodations are modern and state of the art. You and your significant other will enjoy relaxing on your private balcony as the sun rises. Inside the room, you're welcomed by their trademark Ultra Comfort Deluxe Bedding and Linen Package. If you decided to spring for the suite then a rejuvenating Jacuzzi bath will be waiting for you. All of the rooms are fully furnished and a loaded to the brim with amenities for you and your sweetheart to enjoy. Some of the top amenities include a flat screen tv with 300 channels, full bath loaded with spa products, high quality furniture to relax in and much more. The experienced staff is waiting for your call and looks forward to helping you plan the romantic getaway of a lifetime. As of 2013 Duluth had a population of over 86,000 people. The resort is located only four blocks from Canal Park. Canal Park is a fun and entertaining location to shop, walk around, dine and enjoy the sights and sounds that make Duluth so fun to visit. Our next romantic Duluth destination is a place where elegance meets casual comfort. The A.G. Thompson House Bed and Breakfast Inn has been selected as one of the “Best B&amp;B’s” in the Midwest by Midwest Living Magazine, and it’s easy to see why. It's got the style and substance to make your visit a classic. Discover a classic 1909 Dutch Colonial bed and breakfast that radiates grace and casual luxury. You’ll be swept away by the shear beauty of the A.G. Thompson House– from its award-winning gardens to its beyond comfortable guest rooms. The Main House boasts four beautifully appointed rooms. Each one is unique and nothing short of extraordinary. These rooms are truly Duluth’s finest accommodations. You’ll rest on Egyptian cotton sheets and fine bedding as you sip a glass of complimentary evening wine. Be surrounded by inspired details like delicious chocolate truffles, luxurious towels, and A.G. Thomson House signature robes. Each room in the Main House features a whirlpool tub, fireplace, and many modern amenities. In addition to the four Main House Rooms, there are three Carriage House Rooms. These immaculate accommodations are the perfect place to spend a romantic getaway. The most luxurious of all is the Lake Superior Suite, with a full size leather sofa and chair, French doors that open onto a private deck, and a magnificent Sterns and Foster Luxury Euro Pillowtop Mattress. Several of the rooms offer mesmerizing views of Lake Superior. It may be difficult to leave your guest room, but when you do you’ll discover even more to marvel over. Stroll through the beautiful gardens or wind down in a relaxing hammock. Curl up with a good book in the sunroom or take in the scenery on the grand veranda. For your next romantic escape, come to the A.G. Thompson House, where you’ll experience the perfect blend of warm comforts, classic elegance, and modern amenities. The A.G. Thomson House is located the heart of Duluth’s Historic Congdon (Glensheen) Mansion District, a quiet and tranquil place amongst the towering pines. It's also close to Canal Park and many other Duluth attractions. The A.G. Thomson House is ridiculously easy to find. Head north on I-35 untill it ends, and then take left onto N 26th Ave E. The A.G. Thomson House will be on your right! With 103 rooms and suites each more luxurious than the last, your deluxe Duluth romance destination simply has to be the Hampton Inn! Discover a superior (get it?) way to vacation at Hampton Inn Duluth! The Lake Superior area teems with activities for couples to partake in, from fishing and boating to scenic hiking trails and alpine slides. If you're lucky enough to be staying in winter, carve up the slopes at Spirit Mountain! Of course, if you just need to relax the Hampton is an ideal place to do so. Slide into the pool, relax in the sunroom, or just park yourself outside a window and watch the massive ships chug along Lake Superior. You'll leave even more in love than when you arrived! All ages will find fun at the Lake Superior Railroad Museum, where you can set off on a rail journey along the North Shore to Two Harbors for an afternoon adventure! Stretch out in your spacious suite, which features a 32-inch LCD HDTV, a Whirlpool bathtub, and a desk with ergonomic chair. Ideally located near the best sights of Duluth, Comfort Suites Canal Park offers you the perfect location for your romantic getaway. 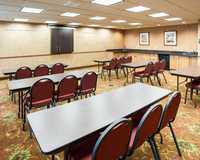 Comfort Suites Canal Park offers comfortable rooms perfect for your romantic retreat to Duluth. These spacious and brightly-colored rooms will ensure you sleep well after a day of spending time with your sweetheart. After a delicious breakfast for two, explore Duluth together. Visit the historic Aerial Lift Bridge. Explore Glensheen, the Historic Congdon Estate, "Duluth's American Castle." Walk the shore of Lake Superior. All this and more awaits you just minutes away from Comfort Suites Canal Park! Kicking off the second half of our list is Beacon Pointe Resort, which offers luxury guest rooms, suites, condos and penthouses – all on the water’s edge overlooking Lake Superior. Beacon Pointe Resort’s location is nothing short of spectacular. Full lake views will provide you with chances to see breathtaking sunrises and sunsets. You’ll be just steps from the Lakewalk, and have easy access to many great amenities. If you and your loved one want to get out on the water, take a 2 hour kayaking tour along Lake Superior’s beautiful shoreline. A experience guide will make sure you have an unforgettable experience. For a more casual day, use one of the resort’s complimentary bikes and head towards Canal Park. At the end of the day, enjoy a cozy lakeside bonfire. Beacon Pointe Resort has many different accommodations to choose from, but they’re all extremely luxurious. If you’re looking for something that’s romantic, spacious and full of incredible amenities, stay in a one-bedroom condo or penthouse. These accommodations feature a Jacuzzi, gas fireplace, and a private lakefront balcony. You and your loved one will feel right at home at Beacon Pointe Resort! So much so, that you may want to return to the resort in every season! If you fall in love with Beacon Pointe Resort, consider full or fractional ownership of one of their luxury homes. For the ultimate getaway, ask about Beacon Pointe Resort's Romance Package that includes rose petals and champagne. If you’re looking for spacious accommodations and you want to be in the Canal Park area, look no further than The Suites Hotel at Waterfront Plaza. The name says it all. This hotel only offers suite accommodations. In fact, it is Duluth’s only all-suite hotel. Each unit features an equipped kitchen with a full size refrigerator, stovetop, microwave, dishwasher and other appliances. It’s a great option if you want to save money on dining out. Every suite also has modern amenities like 27” televisions with HBO and complimentary Wi-Fi. Stay in a One-Bedroom Whirlpool King Suite and you’ll get all of the previous features, plus a romantic two-person whirlpool bath. The Suites Hotel at Waterfront Plaza is located in the heart of Canal Park’s entertainment district meaning you’ll be just steps away from some of Duluth’s best attractions including the boardwalk, Aerial Lift Bridge, and the Lake Superior Maritime Visitor Center. There’s so much to see and do, you’ll have to make return visits. Let The Suites Hotel become your home away from home in Duluth! If you feel like staying back at the hotel, enjoy their indoor pool and spa. Complimentary breakfast is served each morning! If you're looking for an upscale romantic getaway along the shores of Lake Superior in Duluth, Sheraton Duluth Hotel is the spot for you. 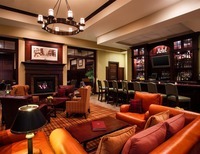 Rekindle the spark of passion during your next trip to Minnesota's North Shore at Sheraton Duluth. With exceptional accommodations featuring plasma televisions, bathrobes and deluxe bath amenities, you and your special someone can enjoy a memorable getaway. Raise the bar with a stay in a suite, ordering room service from the onsite restaurant. Rooms on the Sheraton Club Level also offer upgraded amenities for an incredible getaway. Spend your days exploring the surrounding beauty of Duluth, or head further north to Two Harbors, Lutsen, or even Grand Marais. With quaint shops and miles of trails along the way, the two of you won't find it difficult to fill your day with fun. The onsite restaurant, Restaurant 301, is warm and inviting, with a glowing fireplace and expansive windows that overlook Superior Street. It's the perfect place to enjoy a romantic dinner for two during your stay! If you feel like taking Fido along on your romantic getaway, Sheraton Duluth Hotel offers pet-friendly accommodations. Historic, romantic, and distinctive. These three words describe Cotton Mansion perfectly! The history of Cotton Mansion is as fascinating as its architecture. The 16,000 square foot Italian Renaissance mansion was built in 1908 by Joseph Cotton, who was Corporate Attorney for US Steel. Inside you’ll find hand-carved stone, Fifteenth Century Italian Marble, exotic woods, and beautiful mosaics. You’re sure to be in awe of the Alabaster fireplace, hand-carved mahogany dining room, and Joseph Cotton’s library. We don’t want to ruin it for you, so take our word for it and discover all of the treasures this mansion holds for yourself. The rooms at Cotton Mansion and the Cottage House Suites will take your breath away. Each room provides a different ambience, but all of them are conducive to romance and intimacy. In each you’ll find two-person whirlpools, fireplaces, and luxurious beds. The Terrace Suite has a private outdoor garden terrace and is an exceptional place to spend your honeymoon or anniversary. But if you’re seeking something that is extremely private and spacious, the two Carriage House Suites will satisfy your needs. At Cotton Mansion Inn, an amazingly beautiful and historic bed and breakfast awaits you, just minutes from Duluth’s best attractions! Enjoy a gourmet breakfast served in the dining room or in your suite. Joseph Cotton enjoyed a unique relationship with US Presidents, which included being chosen by Teddy Roosevelt to give his second nominating speech at the 1904 Republic Convention in Chicago.